4 Bedroom End of Terrace House For Sale in Uckfield for £345,000. 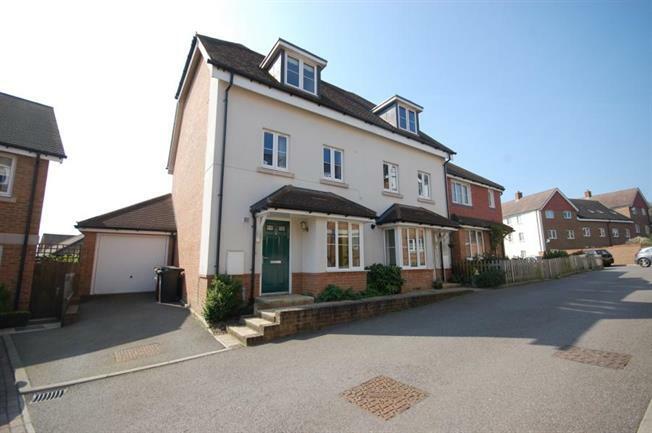 Stunning 4 bedroom spacious end of terraced home situated on this popular development within the village of Five Ash Down. Entrance hall with cloakroom. Fitted kitchen with applicances, large living/dining room with doors out to the garden. On the first floor there are three bedrooms with the family bathroom. The second floor has a super double aspect master suite with fitted cupboards and an en-suite shower room. Outside there is a driveway and garage. The garden has a patio area and is fence enclosed. The village offers a local shop and pub. Uckfield is closeby with good range of shops schools and main line station to London.